The next step is to create the send ports used in the BizTalk application. 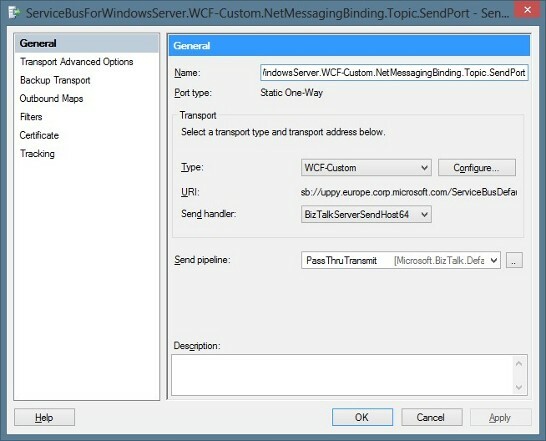 This topic lists the steps to create the WCF-Custom send ports used by the StaticSendPortOrchestration and DynamicSendPortOrchestration orchestrations to send response messages to the requestqueue and requesttopic. Specifically, the StaticSendPortOrchestration uses two static one-way send ports, one for each messaging entity. The DynamicSendPortOrchestration uses a dynamic send port that decides at runtime where to send the response message. The end location is based on the address specified by the client application and contained in the ReplyTo context property. Open the BizTalk Server Administration Console and expand Send Ports under the ServiceBusForWindowsServer application. Enter a name for the send port and select a pipeline based on your requirements. This sample uses the PassThruTransmit pipeline. 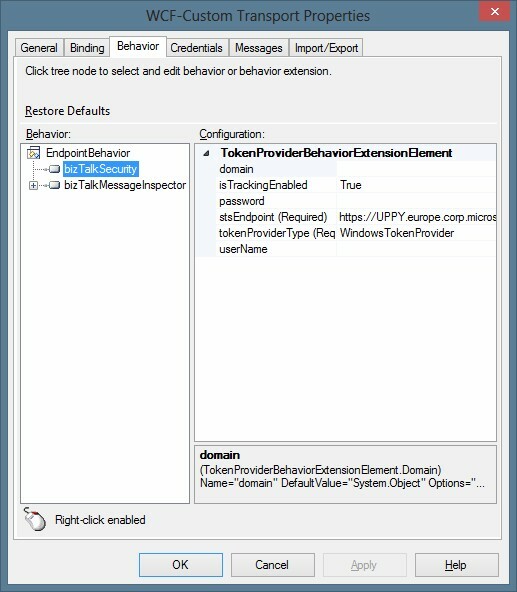 Click the Behavior tab, right-click the EndpointBehavior node and click bizTalkSecurity. Click the corresponding node, click the token provider and enter a domain, user name, and password. For security reasons, it’s not recommended to use the same account as the host instance. 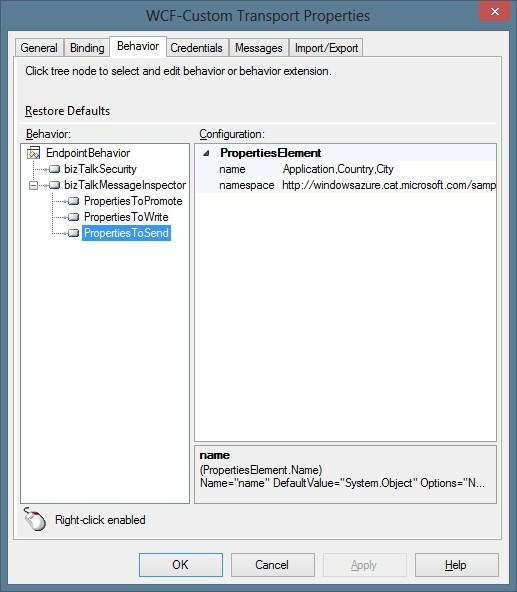 Right-click the EndpointBehavior node and click bizTalkMessageInspector. Click the PropertiesToSend node and enter the name and namespace lists of the user-defined properties to include in the outgoing message. In this sample, the send port adds the Application, Country, and City properties to the response BrokeredMessage. The Application context property demonstrates how a BizTalk application can send context information out-of-band to another application using a Service Bus message. 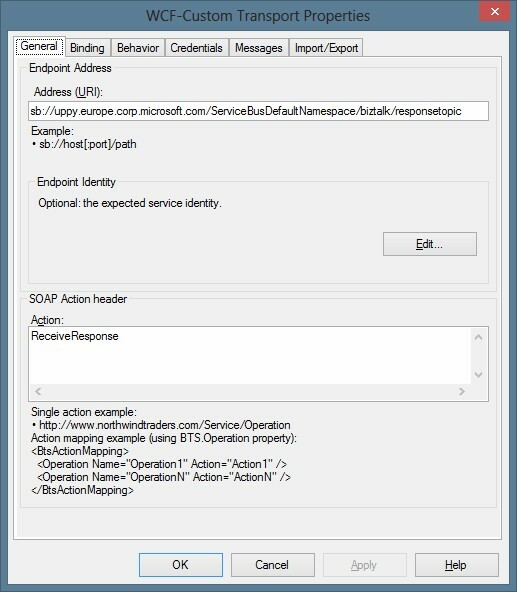 The Application property is added to the response BizTalk message by the orchestration. 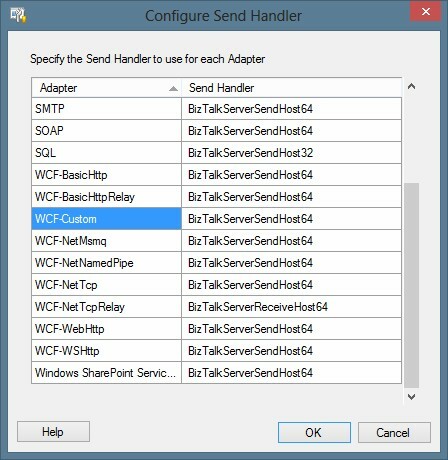 Click OK to close the WCF-Custom adapter configuration dialog. Click OK to complete the creation of the WCF-Custom send port. Click the Behavior tab, right-click the EndpointBehavior node and click bizTalkSecurity. Click the corresponding node, click the token provider, and enter a domain, user name, and password. For security reasons, it’s not recommended to use the same account as the host instance. In this sample, the send port adds the Application, Country, and City properties to the response BrokeredMessage. The Application context property demonstrates how a BizTalk application can send context information out-of-band to another application using a Service Bus message. 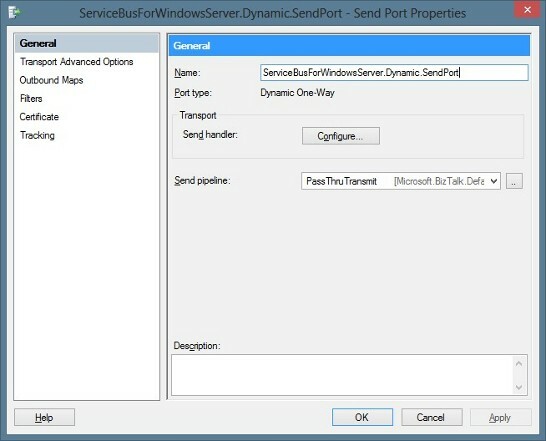 Create the dynamic send port used by the DynamicSendPortOrchestration to send messages to the responsequeue or responsetopic, based on the URL specified by the client application in the ReplyTo property of the Service Bus message. 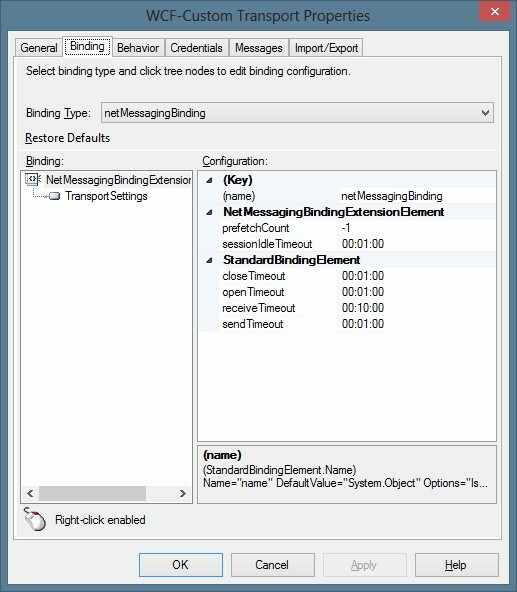 Click OK to close the Send Handler configuration dialog. 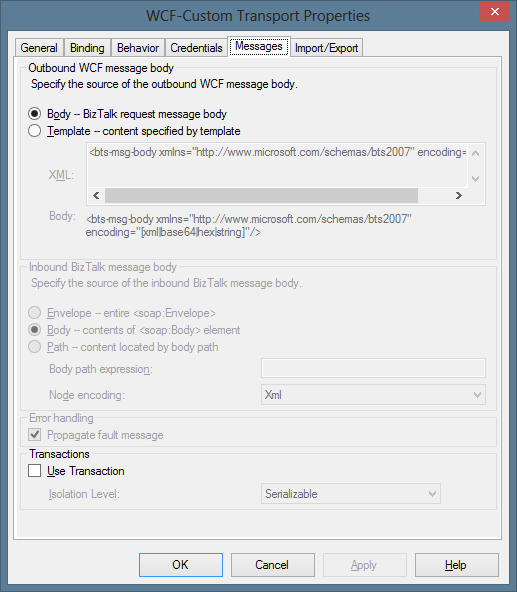 Click OK to finish creating the WCF-Custom send port.